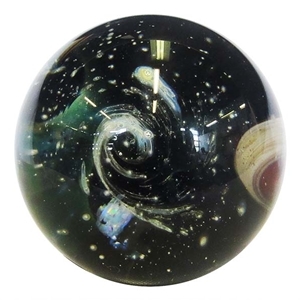 MoonMarble.com - Luke Stone - "Outer Space Marble - Vortex"
Art Glass → Contemporary Handmade Marbles → Luke Stone - "Outer Space Marble - Vortex"
This is a handmade contemporary art marble representing outer space by artist Luke Stone. This marble has a very ethereal and deep spacey look to it. There is a red and white planet, stars, a galaxy, a vortex, and atmospheric layers. Approximately 2" in diameter. It is signed "LS" and dated.